Hospital cleanliness emerged as a major concern for nearly one-third of Canadians who answered a survey on patient experiences conducted by CBC-TV's the fifth estate. Deborah Martin recalls her distress the day she walked into a Kelowna, B.C., hospital to learn her 72-year-old mother had been left lying in bed sheets soiled with feces overnight. "They couldn't keep up with the amount of time she had to go to the washroom [so] she'd have an accident," said Martin, who lives in Angus, Ont., and travelled to B.C. with her husband last fall to take care of her mother. "I came in one morning, and she'd been sitting in it all night long. She had called for help, and it just didn't come." Martin's story is disturbingly similar to many of the 3,500 submissions to an online survey about patient experiences done by the fifth estate as part of Rate My Hospital, a sweeping week-long series on the state of Canada's hospitals. Nearly a third of respondents, who included patients, health-care workers and relatives and friends of patients, said hospital rooms and bathrooms were not kept clean. Stories shared by respondents from across the country described soiled bathrooms, patients left lying in their own waste and pleas to seemingly harried nurses that went unanswered. Karl Rinas, 61, who was treated for a bleeding ulcer at a Leamington, Ont., hospital last February, says he ended up wiping down the bathroom himself after his complaints about the dried liquid waste he found on the floor and toilet seat failed to get a reaction, but he worried about older, less mobile patients. "If I was a little sicker, I would have walked through that slop," he said. "I wouldn't have wiped the seats off. I would have been in the goo, and that's what's so sad." Martin says she, too, brought her own sanitizing wipes to the hospital where her mother, who suffers from Lou Gehrig's disease, was being treated after she discovered urine on the floor and the toilet seat. She said she always cleaned the bathroom before her mother used it, changed her mother's soiled bed sheet after a request for new sheets went unheeded and gave her mother sponge baths because she found showers were infrequent. Despite all her efforts, Martin says she has no doubt that the antibiotic-resistant superbug Clostridium difficile infection her mother contracted soon after surgery was related to the hospital's level of cleanliness. "I know everybody nowadays has to work more with less, but to me, a hospital should be absolutely clean," she said. Of the respondents who wrote into the fifth estate's survey about being harmed in hospital, most said the harm was a hospital-acquired infection such as MRSA and C. difficile. MRSA develops on the skin and is transmitted through skin to skin contact with an infected person or a surface they've touched. C. difficile is spread via surfaces or skin that have come in contact with feces infected with the bacteria. About one in 10 patients admitted to hospital in Canada contract hospital-acquired infections, and between 8,000 and 12,000 die from them each year. Canada doesn't track infections federally, and provinces vary in which infections they require hospitals to report. The Canadian Nosocomial Infection Surveillance Program is the closest thing to a federal overview that Canada has, but it relies on voluntary reporting by only 54 hospitals in 10 provinces, most of them teaching facilities, which, according to infection control experts, generally have higher infection rates than other acute care hospitals because they tend to see more seriously ill patients. A World Health Organization report that compared Canada's infection data with that of 12 other wealthy countries found that Canada had the second-highest prevalence (11.6 per cent) of hospital-acquired infections after New Zealand — much higher than that of Germany (3.6 per cent) or France (4.4 per cent). C. difficile infections, in particular, which generally afflict patients who are already vulnerable and are fatal in about five to 10 per cent of cases, have been on the rise not just in Canada but in the U.K. and the U.S. as well. In the last 10 years, there have been several high-profile outbreaks of the superbug in hospitals in Quebec, British Columbia and Ontario that resulted in patient deaths. Those three provinces continue to have the highest prevalence of C. difficile. Those who work in hospitals have pointed to the increased outsourcing of housekeeping in recent years as one reason behind the decline in hospital cleanliness that patients and hospital workers have observed. 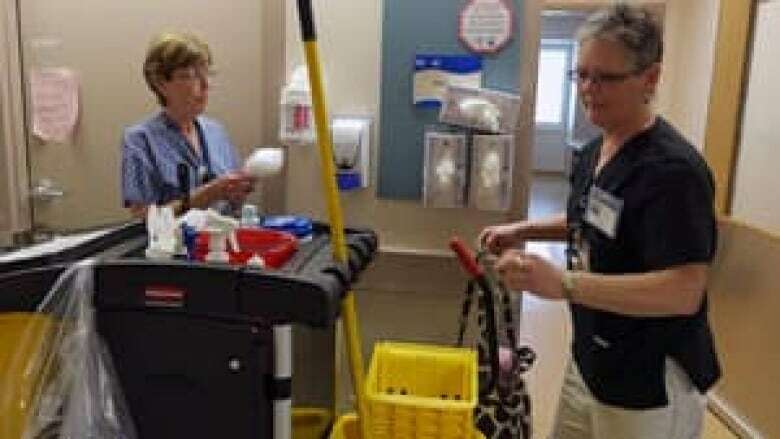 "There's no question there's been an impact on the quality of cleaning, and you can see that throughout the years as various hospitals have struggled with very high-profile superbug outbreaks," said Margi Blamey, spokesperson for the Hospital Employees' Union (HEU), which represents 41,000 hospital cleaning and support staff in B.C. A decade ago, B.C. passed legislation that allowed hospitals to outsource previously unionized cleaning and food service jobs to large multinationals like Aramark and Sodexo. The move that has been replicated by hospitals in other provinces. But health authorities in other countries are moving away from private cleaning services. Four years ago, Scotland reversed its decision to allow outsourcing of cleaning and catering services because it felt private contractors were not doing a good enough job keeping the spread of infections in check. Blamey says as long as housekeeping is done on a for-profit basis, employers will reduce the number of staff and cut corners on staff training and cleaning supplies. "Keeping a hospital clean is contingent on the number of people doing that job, so when you cut that down, you have to make choices on what areas get cleaned [and] how often they get cleaned," Blamey said. Unlike in the food industry, there are no standardized inspections for cleanliness in hospitals. B.C. instituted housekeeping audits to verify whether hospitals meet industry cleaning standards, but they have not proven a very accurate measure because they rely heavily on a visual assessment. The Nanaimo Regional Hospital on Vancouver Island and Burnaby Hospital in Metro Vancouver both exceeded the industry benchmark in their audits in years when the hospitals had fatal C. difficile outbreaks with infection rates three to four times the Canadian average. A BC Centre for Disease Control investigation found that during a 2008 outbreak, the Nanaimo hospital had insufficient numbers of cleaning staff to meet its basic daily needs. Michael Gardam, who oversees infection prevention and control at the three hospitals that are part of Toronto's University Health Network, agrees that hospitals have fewer resources for housekeeping these days and have to concentrate cleaning on areas that are most likely to transmit bacteria — primarily the surfaces that multiple patients touch. "I probably get more emails about dust bunnies in the stairwells than anything else in the hospital, and yet, we've done that for a reason. You're not going to catch anything from a stairwell, but you're going to catch it from your bed rails," Gardam said. While cleanliness was a major cause for concern for those who answered the fifth estate patient survey, many respondents also talked about feeling alienated by the hospital system and getting the brush-off when they tried to raise issues of concern with staff. Most respondents said they sympathized with nurses and doctors who seemed rushed and overworked but wished these professionals would communicate more openly and sympathetically with patients and family members. "She lost her quality of life in hospital," wrote one respondent about her 91-year-old mother, who was blind and who died in a Kingston, Ont., hospital. "I think she lost her dignity as well because everyone talked about her but not with her." Many people said they left the hospital feeling demoralized and disillusioned with the health-care system. "We wait hours to be seen with no explanation why," wrote a survey respondent from Fergus, Ont. "The entire emergency room staff desperately needs training on how to work with people. I always leave angry and wishing we had just stayed home instead." "We also don't care that much about the floor, because it's less likely you're going to pick something up off the floor than you're going to pick something up off your bed rails or your bedside table or your bedside telephone or your call bell." About two-thirds of hospital-acquired infections are preventable, Gardam said, but making a direct link between cleanliness and infection is not as straightforward as it might seem. Some hospital-acquired infections such as ventilator-associated pneumonia or central line-associated bloodstream infections have little to do with the hospital environment and can be controlled through proper protocols around equipment use. But a superbug like C. difficile is a lot trickier because it is hard to pinpoint its source. "If you're a patient sitting in a bed, and that bed hasn't been cleaned properly, and you pick up C. difficile, and you eat your lunch, and you swallow C. difficile and get colonized, how am I going to say you got it that route versus me not washing my hands and coming in and checking your blood pressure?" Ontario hospitals' rate of compliance with handwashing protocols for health-care workers has risen dramatically in recent years but has not brought about a commensurate decrease in infections, says Gardam. That might indicate that hospitals need to focus on the other means of reducing the spread of infection such as patient handwashing, the use of private rooms and keeping occupancy below a hospital's full capacity. Increasing cleaning staff on nights and weekends could also help. A typical medium-sized B.C. hospital that contracts out cleaning services has 24 cleaners by day but only four at night, says Blamey, and workers are often not backfilled when ill or on vacation. "Bacteria don't care what time it is," said Gardam. The infection expert says it doesn’t matter whether a private or public entity oversees cleaning; both have had problems with cleanliness. The bottom line is that hospitals generally undervalue the importance of cleaning staff, Gardam said. "People don't really think of them as part of the team, but if you think about how infections are spread in hospitals, they're actually an incredibly important part of the team that goes far beyond just the cosmetic appearance of the room." An earlier version of this story mistakenly identified Deborah Martin as Barbara Martin.